I’m not a book collector. I own very few first or special editions purchased to create or build a valuable collection. Mostly, I just buy, a book aggregator forced to periodically cull my library in order to continue aggregating. I’ve owned very few books written by Winston S. Churchill, but have never culled any of them. Each I’ve always considered special enough to keep, to read over and over when, in childhood, I owned few books; later to prominently place on my first college-era bricks-and-wood plank shelving; later still to repeatedly cart from state to state as my entire library grew from a few books to twenty cases worth; and occasionally to shell out for better editions of old friends. Book collectors and aggregators own books by the scores and hundreds that they’ve never read or will never read again. Holding on to my Churchill books is one thing, but is there any reason to read him today? Even when they were published, Churchill’s chief works, his memoirs, biographies, and histories, all stood out from the competition, whether in the 1890s, 1930s, or 1950s. They grabbed readers’ attentions in singular ways. Today, with one possible exception, they have been overtaken by decades of fresh discoveries, more rigorous standards, history’s far wider scope, and the jettisoning of Churchill’s Victorian world views. Why then, would anyone read Churchill today? Because his command of English, however quaint his style, and his exceptionally intelligent and intuitive grasp of what it meant to exercise power and authority, in any century, render his opinions on great men and great-and-not-so-great deeds compelling. The next few blog posts address three of his most important works: The Second World War, the History of the English-Speaking Peoples, and Marlborough: His Life and Times. I was introduced to these three, in one form or another, decades ago. I remain attached to them, for personal reasons. I try to answer why anyone else should read them now. Churchill and the Editors of LIFE, The Second World War (hereinafter TSSW), Special Edition Published for Young Readers (Golden Press, 1960, 384 pages). Condition of my copy: Read many times. Fair to good; complete and intact. Some small stains. There are many, many illustrated histories of World War II. This one is packed with more color images than most. And perhaps because Churchill himself was skilled with a brush, the images include many more paintings than one finds in illustrated WW2 histories. 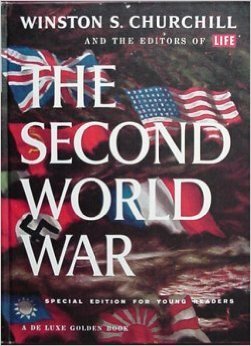 Second, Churchill’s book placed greater emphasis on Britain’s war than one sees in books generally found in US book outlets. Dunkirk, the Blitz and Battle of Britain, the sinking of the Bismarck, the 8th Army’s North Africa campaigns against the Italians and Rommel, the Singapore debacle, and the Gold-Juno-Sword beaches that the British and Canadians stormed on D-Day, among other operations, receive more space than one finds in most survey histories. Third, Churchill was alone among the “Big Three” allied leaders (including FDR and Stalin), as well as the opposing Axis leaders, in living to tell his story of the war. Because TSSW book is a memoir rather than a history, Churchill presents his case for the strategies he pursued and the decisions he made (many controversial to this day). Fourth, TSSW was my introduction to Sir Winston’s inimitable writing style, set forth by the man himself, as well as, it must be admitted, a team working under his guidance but intimately familiar with his style (more on that below). The original six-volume work is filled with his memorable wartime speeches and both complete and extracts of his telegrams and memoranda to world leaders, British cabinet members, generals and admirals, all of them written with both victory and legacy in mind. This abridged edition is largely limited to extracts. Edgar R. Murrow and John F. Kennedy both observed of Churchill’s own “finest hour” in 1940-41, that “He mobilized the English language and sent it into battle.” I was already aware, of course, of Churchill’s most famous phrases that coursed through his dark days speeches (“blood, sweat, toil, and tears;” “never have so many owed so much to so few;” “we shall fight them on the beaches… we shall never surrender;” etc. ), but the book’s narrative was my first immersion in his narrative style, at once personal, even conversational, as if one listened to his musings over cigars and brandies. The narrative is filled with his personal dealings with FDR, Stalin, DeGaulle, Eisenhower, and a host of British generals. He peppers his story with puckish humor, and with analogies to other historical conflicts and persons. His account is melodramatic, dire in its depiction of Britain facing the receiving end of a 20th century Waterloo, yet optimistic in his belief in the ultimate triumph of democracy. READER RECOMMENDATION: For those lacking time to read Churchill’s 5100-page, six-volume opus, this is an excellent abridgment. More than a half-century after its publication, the book remains a perfect companion to other World War II histories with an American focus. The “Churchill Book Specialist” says of this book, Don’t ignore this edition. It features a superb collection of photos, drawings, and paintings, many in colour. Finally, its text was written, edited, and supervised by one of the great literary geniuses of the twentieth century, albeit a stylistic and ideological throwback to Victorian times.